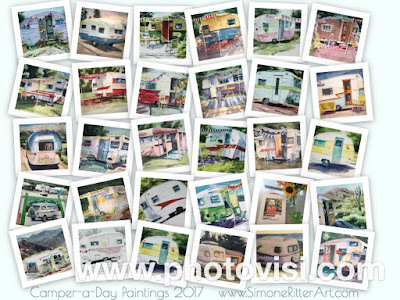 Simone Ritter Art: Vote for your favorite paintings! Vote for your favorite paintings! This collage shows all paintings I created this September past. It was a lot of work, but I enjoyed the journey very much! Thank you for all your encouragement along the way- it means so much! 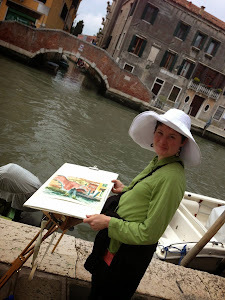 Now I am asking YOU to tell me which glamper paintings you enjoy the most! Please ‘like’ as many as you want, come back often and tell your friends! The more people participate, the more fun! The 12 most voted-for campers will be featured in my 2018 calendar! Side note: Please allow a couple of seconds to add your vote (clicking often and very fast will cancel your ‘like’ again). Only one like per image per visit. The link below should bring you directly to my website voting page. What's Your Favorite Camper? Voting Has Started!